When it comes to the perfect union of style and comfort, there are three things in this world I believe to be universally difficult to shop for: jeans, swimsuits, and desk chairs. One size and one style most certainly does not fit all. I'll leave the jeans and bikinis to the fashion bloggers, but today I'm go to share my search for a chic and comfy task chair with a price tag under $200. I recently made the transition to working from home – while simultaneously moving into our new (to us) home. Since the site of my future office was bogged down with cardboard boxes, I spent the first week of working off-site working from the couch, recliner, dining table, and occasionally my bf's desk for a call or meeting. It was not ideal. I quickly found out that I'm not going to be on of those off-site workers than can feel and be productive while snuggled up in a big, comfy chair. I needed a workspace. This past week, I got my desk set up. It's perfect. I love it. And I felt so much more productive with a place to set up my double monitors and a real mouse. The lingering problem: my chair. I guess I took my chair at the office for granted. Compared to past jobs, it didn't cause me back pain. It was comfortable. It was bright green, which is kinda fun. At home, I've been getting by with a dining chair that I found at Goodwill last summer and spruced up with chalk paint and fabric spray paint. Don't get me wrong – it's darn cute! But it's darn uncomfortable, too. So I've been on the lookout at every store I step foot in. And I've been scavenging the likes of Pinterest, Amazon, and Overstock for a good chair that meets my requirements: 1) Aesthetically pleasing. Office chairs cross into ugly territory all too often. 2) Comfortable... at least boasting some cushion here and there. 3) Convenient. I need wheels to move around my desk. And 4) affordable. 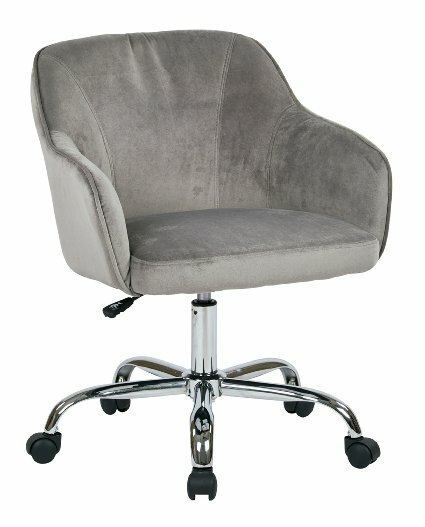 I'm just not willing to pay more than $200 for a desk chair. In the depths of Pinterest, I found some great DIY ideas for revamping boring task chairs. But with a do-it-yourself to-do list about a mile long since we purchased this house, this is one item I decided to just find and buy. PB Teen didn't reinvent the wheel – err, the wheeled desk chair – here, but the slight variation in the chair back's shape, the preppy pattern, and the pretty mint color are a refreshing take on a basic. It also comes in navy. A little shiny chrome and a bit of crisp white vinyl go a long way – as apparent in this simple but classy desk chair. I like that it's clean and versatile enough to fit in with different decor styles. This chair had me at "velvet." Velvet could roam right into the realm of gaudy soooo easily. But this one doesn't. It looks soft, chic, and yet understated. Besides the beautiful charcoal color pictured, it comes in a dark greenish blue and creamy ivory. Faux white leather and the look of brushed steel come together in this sleek chair. The design is modern, but timeless. It looks comfy with those arms, too. This one was a real contender for me – if only I were within a couple hours of an Ikea... or shipping costs weren't so outrageous. (A girl can dream.) The chair's design was inspired by workspaces of the 1880s to 1920s, which I adore. Vintage feel, modern twist. The color's great, too – as is the price tag. While Ikea claims it is "as strikingly good-looking as it is comfortable" ...they've got me on the good-looking part, but it just doesn't look that comfy. Maybe I'm wrong? This is a downright handsome chair. It's a little modern for my taste, but I had to share it because of the sophisticated combination of white + chrome + wood grain. It looks like it'd be comfortable to sit in for a while, too. With this chair, it's all in the details. The padded vinyl seat and back boasts a quilted-liked lattice pattern, which adds a little extra oomph to plain white. I also love that the design confident forgoes the expected chrome, and opts for a white chrome base instead. The black and white is elegant, modern, and bold. It's not quite my style, but I love this chair. I wouldn't be "me" if my furniture roundup didn't include a tufted piece. I love me some tufts. And they're the main feature on this simple but lovely desk chair. It also comes in white. This contemporary wood chair possesses a curved natural wood back and seat and white leather. It's gorgeous. It's slightly mid-century. And even though it's not really the look I'm going for in my office, I had to include it because of its good looks and visible comfort. Wouldn't you feel like such a #GirlBoss sitting in this?! You know, this is initially exactly what I was looking for: a simple desk chair upholstered in a bold and pretty colored fabric. It's understated, but has tufts. It's classic, but has a nice, bright color. Besides this lovely green, it's available in light blue, slate gray, and taupe. This one made the list because it's simple, chic, and totally affordable. It plays on the crisp white paired with gleaming chrome. It boasts clean lines and silhouette that's versatile enough for different decor styles. And only about $65 (on sale). Quite a bargain. Okay, so... one of these chairs is actually on its way to me right now! Which one did I order? I can't wait for it to arrive so I can try it out, photograph it at my desk, and share my review with all of you. Which of these twelve desk chairs would you want in your workspace?